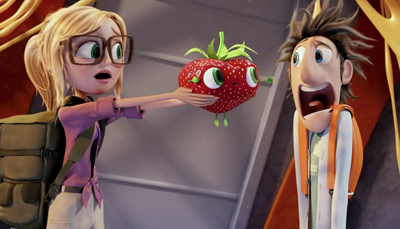 Cloudy with a Chance of Meatballs (henceforth known as Cloudy) was one of biggest surprises of 2009 for me. By then I was so accustomed to Pixar supremacy that any other animated film always seemed to fall short. But Cloudy ended up demonstrating a lot of character and to perfectly portray the endearingly fidgety energy of its main character Flint Lockwood. Fast forward to Cloudy with a Chance of Meatballs 2 (henceforth known as Cloudy 2), a film that manages to pack in a lot of the same charm present in Cloudy, but regrettably sacrifices a more meaningful story for one overstuffed with laughs and not much structure to hold everything in place. Cloudy 2 begins with a recap of the first film and the fall out of the food storm caused by Flint Lockwood’s (Bill Hader) invention, the “FLDSMDFR.” Due to the island of Swallow Falls being completely covered in foodstuffs, the entire community is forced to relocate until the island is cleaned up. Despite making plans to create his own lab with friends Sam Sparks (Anna Faris), Brent McHale (Andy Samberg), Manny (Benjamin Bratt), and Earl Devereaux (Terry Crews), Flint decides to work for his childhood science idol and Steve Jobs look alike Chester V (Will Forte), whose company The Live Corp is charged with restoring Swallow Falls to its former glory. But the image is rosier than the reality, and it soon becomes apparent that Chester V has other intentions for Flint, his friends, and their home of Swallow Falls. As someone who really enjoyed Cloudy I was somewhat disappointed with the story in Cloudy 2. Both films tackle similar issues such as the pitfalls of overconsumption, greed, and idol worship but where Cloudy was successful in making a structurally sound film with a gratifying payoff, Cloudy 2 progresses at such a breakneck pace it can only throw ideas at the wall in the hopes that something will stick. The film’s climax and conclusion happen almost suddenly and the reasons for Chester V’s duplicity, while evil, hardly matter once we get there. Instead, the only thing that remains memorable is the heavily layered humor evident in every scene. Yes, the food puns are back with a vengeance, along with enough sight gags to cover everyone in the audience and then some. If Cloudy has the naturalistic energy of a healthy six-year-old, Cloudy 2 is that child’s sugar-addled cousin bouncing off the walls. This is my biggest problem with Cloudy 2 and why this film feels less adult-friendly then its predecessor. There are few quiet moments of realization for the characters and when they do exist, they are overpowered by a joke or the need to keep the train moving. Despite inferior story execution, I actually like the ideas behind Cloudy 2, and the new characters introduced. The film boasts a much more robust and sinister villain in Chester V and The Live Corp, whose resemblance to Steve Jobs and Apple, and indeed the entire tech culture as a whole, is no mere coincidence. Once it is discovered that Flint’s FLDSMDFR machine has created a self-sustaining ecosystem of “foodimals” on Swallow Falls, the group goes on an expedition style adventure to the island. The audience is treated to numerous references to Jurassic Park, sometimes shot for shot reconstructions, with Sam Sparks sporting Laura Dern’s now recognizable wardrobe. Among the parade of adorable foodimals is a gibbering strawberry named “Barry” and a colony of swimming marshmallows. There is a lot of fun to be had here, and the colorful visuals further support the fantastical environment. 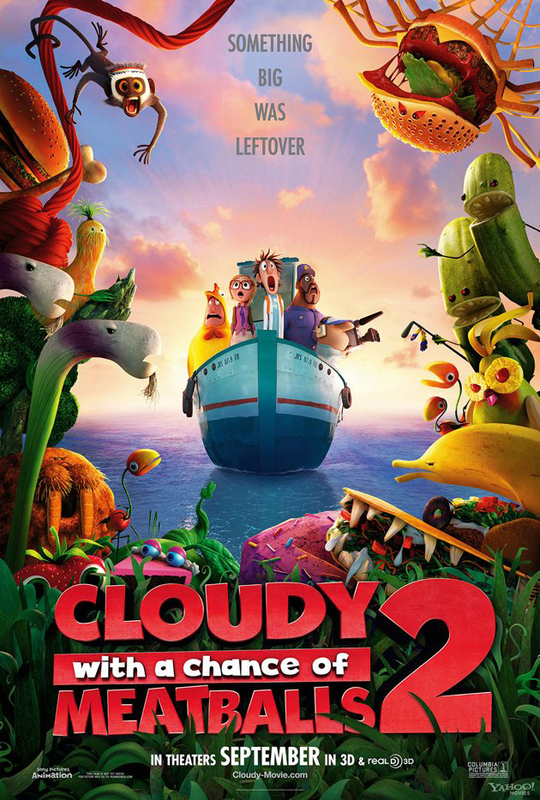 Cloudy 2 succumbs to the same fate that many sequels do, by taking what worked in the first and making it bigger. An irony when you think of one of the core morals of the Cloudy story; bigger is rarely, if ever, better. While the quality of humor in the film is high, the quantity manages to overpower just about everything else, which only demonstrates a lack of confidence in the core story the film is telling. Bright colors, boundless energy, and adorable foodimals will keep the kid in us all entertained, and probably in need of a nap. 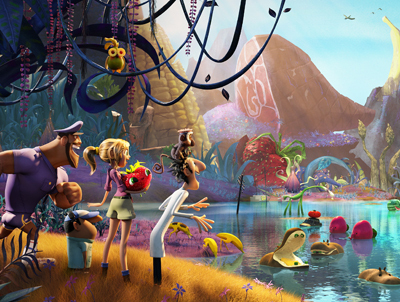 Cloudy with a Chance of Meatballs 2 opens today in Philly area theaters.